Home » » New Image from 'Katniss's Journey' At The Hunger Games Exhibition Revealed, Grand Opening Ceremony Cancelled? New Image from 'Katniss's Journey' At The Hunger Games Exhibition Revealed, Grand Opening Ceremony Cancelled? 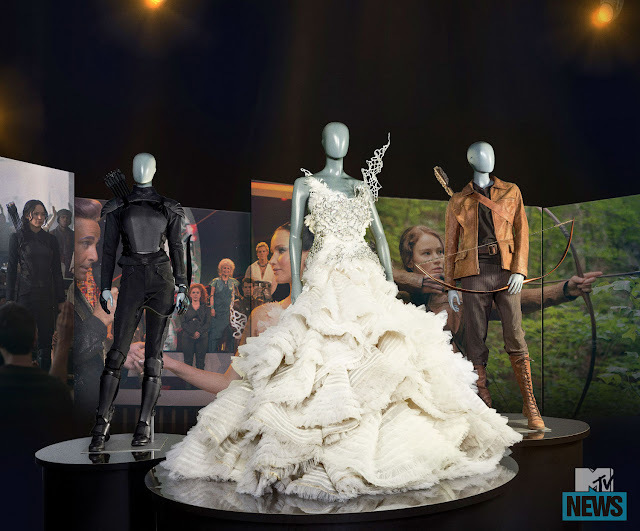 It's just a few weeks to go now until The Hunger Games: The Exhibition opens in New York City's Discovery Times Square, and MTV have scored a brand new image from the 'Katniss's Journey' area, which features the 3 iconic outfits worn by Katniss - the hunting outfit, the wedding dress from Catching Fire and the Mockingjay suit. Celebrate Katniss’s brave transformation from tribute to the Mockingjay in this moving finale. See Katniss’s most iconic costumes up close, including the Mockingjay dress and the Mockingjay armor, see pivotal moments from the films, and be completely inspired by the power of one person to change the world. In other news, we've just heard a few hours earlier that the planned Grand Opening ribbon-cutting ceremony that was due to take place on July 1, which Francis Lawrence and Nina Jacobson previously said they'll attend with other cast members planned too, has been cancelled, according to Discovery Times Square (thank you @catchingmockingjay on Instagram for finding this out). Since sometimes venues do get misinformed regarding any plan changes - we've reached out to Lionsgate to clarify the situation, so please treat this as a rumour for now. UPDATE: Lionsgate got back to us saying: "We’re excited for the grand opening of The Hunger Games: The Exhibition on July 1st and we’ll share more info on any events timed to the launch when we have them." Book your tickets to the New York run of The Hunger Games: The Exhibition here - the exhibition is open at Discovery Times Square until January 2016, after which it's planned to go on a tour around select cities in the U.S. and across the world.